Still there, hope the notification bug is fixed. Getting this on both WiFi and LTE. 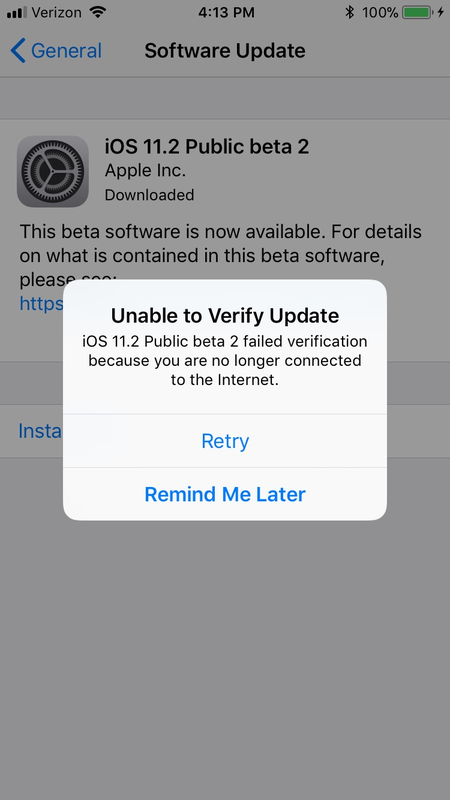 Update won’t verify when I click install. What happens after you restart the device ? I get the same error. I have rebooted, removed the download rebooted, removed and reinstalled the carrier profile, etc., rebooted . Still the same error message. Happening to me, as well. I find their twitter support is very good. After providing them details I've not seen any popup yet. Touch wood. Ok so persistence paid off. I finally got it to verify. Thought B2 might fix the issue I was having on B1, but no joy. I’m unable to place or receive calls to/from the Samsung S8 phone. First noticed it on my wife’s S8, and verified it on the phone of the guy at the vzw store. Any iPhone and any other android phone seems to work fine. 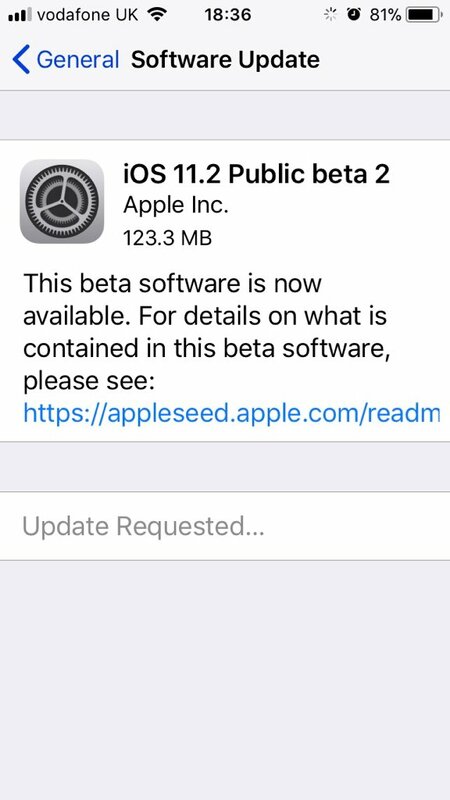 Sent feedback through the app, and contacted apple support. So far no answers. It’s been awhile since I had to roll back software...is there a way to roll back to 11.1? My guess too. I tried later in the evening and it went right through. 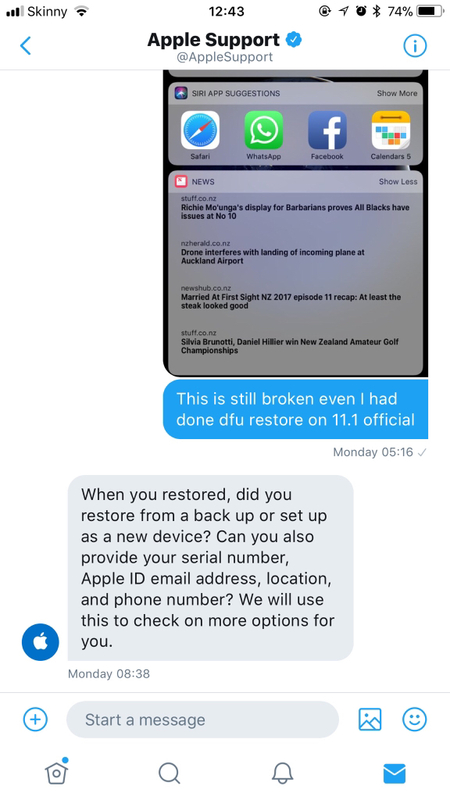 Any one having issue with the message app. I click to open but then it closes before i can select a contact and send a new text. No. The Messages app is working as it should on my iPhone X. Have you tried rebooting your iPhone? Yeah, reboot like 3 times. If i get a text first then i can open from the lock screen. But i cant go thru the app directly. Siri to the rescue. Siri can send text messages. Work around for now. I'm having an issue where the music player is always displayed on the lock screen. I have rebooted the phone many times and still have the same issue...running an 7Plus. Music now also completely stops working if an alarm goes off while its playing (Spotify). I have to kill the app in order to get it to play again.